The property damage done by Hurricane Florence's epic flooding and pounding wind is becoming clear — and fixing what broke won't be cheap. (CNN) — The property damage done by Hurricane Florence’s epic flooding and pounding wind is becoming clear — and fixing what broke won’t be cheap. North Carolina took the brunt of the storm’s fury amid days of drenching rain and, predictably, lost the most, a pair of analyses show. Lawmakers there are set to meet starting Tuesday for a special session to debate how to undertake and pay for the recovery. The top-end estimate of property damage reflects the effects of floodwaters and strong winds on thousands of single-family homes across an enormous disaster zone, according to Moody’s Analytics. “Many of the areas that experienced flooding in the aftermath of Hurricane Matthew are enduring similar tribulations this fall, but the footprint appears to be significantly broader following Florence, stretching about 200 miles west from the North Carolina coast and spanning 150 miles from north to south, extending into South Carolina,” analysts Ryan Sweet and Adam Kamins wrote, comparing Florence with the 2016 storm. That’s the maximum estimate of all flood losses across the zone, including from storm surge, rain and rising rivers, an analysis by the firm CoreLogic shows. Again, North Carolina is thought to have suffered most, with $22 billion in losses, followed by South Carolina with $5.5 billion and about $1 billion in Virginia. The total is about half the $66 billion, adjusted for inflation, in property lost in 2005 to Hurricane Katrina‘s flooding across five states, most of it in New Orleans. As in Katrina, most homes and businesses devastated by Florence’s floodwaters were not insured for damage from rising water. Those homes account for more than two-thirds of the total estimated uninsured flood loss, CoreLogic’s estimate shows. 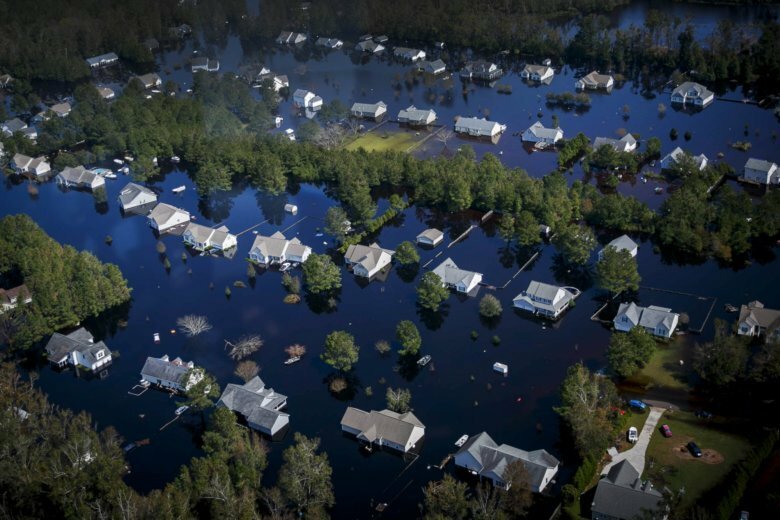 In North Carolina alone, floods could cost uninsured home and commercial property owners as much as $14.5 billion, while the figure could reach $3.5 billion in South Carolina and $500 million in Virginia. That compares with some $40 billion in uninsured losses sustained last year when Hurricane Harvey slammed the Texas Gulf Coast, then drenched the Houston area for days. Most private insurance policies don’t protect against damage from floods caused by storm surge, rain or overflowing rivers. For that, the National Flood Insurance Program, known as NFIP and run by FEMA, provides coverage; in fact, it’s required for federally backed mortgages in areas judged to be at risk of flooding. But many homes that sustain flood damage every year nationwide lie outside designated flood zones — often because federal flood maps don’t accurately reflect the risk of flooding. Property owners also sometimes let their flood insurance lapse because they don’t have a mortgage or because their lender doesn’t check. That’s the upper end of what the NFIP is expected to have to pay out for federally insured losses to residential and commercial property, according to CoreLogic. In all, about 445,000 properties across the three states are covered by the government-backed policies. That kind of payout could strike another blow to the NFIP, which last year got into hot water when it had to pay out $8.7 billion in claims for Hurricanes Harvey, Irma and Maria, the third highest total in the its history. Those payments would have pushed the program’s finances past its borrowing limits, but Congress forgave $16 billion the program owed the federal government so it could pay out the claims. The problem still exists, and it boils down to this: NFIP premiums aren’t high enough to accurately reflect risk. But Congress is loath to raise rates and tick off people who live in flood zones. So, the well of money from which to draw claims remains precariously low. Though Florence was known primarily as a rain event, losses from wind damage could cost residential and commercial property owners more than $1 billion, CoreLogic found, noting that such damage is covered by standard homeowners’ insurance policies.